The other day, we showed you a leaked image of the front of the BlackBerry A10 Aristo. This is the model that is making BlackBerry CEO Thorsten Heins excited and has already been called the most powerful 'Berry ever. You would think that it would be the first quad-core BlackBerry model with a 1080 x 1920 resolution screen, but it is not. Apparently, what passes for a top-shelf BlackBerry is a model powered by a dual-core processor carrying a 5 inch 720 x 1280 resolution screen. Android users have a name for these kinds of phones: a mid-range model. Since we showed you a leaked photo of the front of the BlackBerry A10, we thought we should show you a leaked photo of the back cover of the phone. 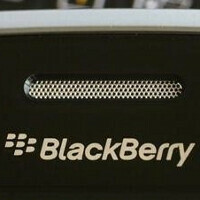 Earlier reports compare the back of the A10 to the back of the BlackBerry Q10 with its weaved glass. We should point out that unlike most BlackBerry models, the A10 will have a separate graphics chip. The BlackBerry A10 is supposed to be focused on gaming, another new bullet point for the Canadian OEM. The back plate in the pictures below carry the AT&T logo giving us a good idea that the carrier will be offering the phone when it launches, supposedly in November. Also expected to be receiving the model is Sprint, which also confirmed the November release date. The leaked back cover was seen in Vietnam. We previously showed you this lesked photo of the front of the BlackBerry A10. Image courtesy of BGR. +1! Totally agree, too identical with Z10! While I agree with the writer's notion that this isn't really a top of the shelf model that Blackberry should be producing, I do think he should be more fair in noting that those are the same specifications carried by the top of the line Windows Phone 8 devices as well. Granted, at least those devices have better cameras but it's still something worth noting. EDIT: I also would just like to say that Blackberry seems to be continuing down the same path, once again, that will lead to failure. They need to seriously step up their game or else I can see them being bought out in a couple of years. Same with windows phone, bring on ubuntu touch and tizen to replace those ailing operating systems. I agree with your sentiments here. Very unprofessional of the writer to say those things. What passes for top shelf on one OS, doesn't necessarily equate to what passes for the same on another OS. In addition to WP8 like you stated, the iPhone 5 doesn't have overall specs that compare to Android's best, but no one can fairly argue that it isn't a top shelf product. It's all about whatever specs make the OS shine brilliantly. Pretty sure they aren't trying to compete. Breaking news the CEO of BRRY has been fired. And? People will Abandon their much-loved Android/iOS phones for this? I don't think even a Windows phone photo-buff would as well, cuz BB has absolutely nothing to offer Somebody give BB a reality check...IT'S OVER! Nice Q10 backing I will say.